Could this quite possibly be the most useless book ever written? Or is its author the smartest man in the universe? If you ask me, it’s a little of both. 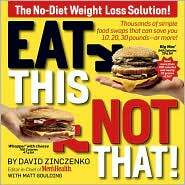 Author David Zinczenko is ca$hing in on the laziness of Americans by catering to their one vice: fast food. In his book Eat This, Not That! he tackles the issue of choosing between which of the worst foods are actually, well, better than the other. Take the example on the cover. Although it’s hard to see, the author—he’s the editor-in-chief of Men’s Health magazine—is telling you to choose a Big Mac (540 calories; 29g of fat) over a Whopper (760 calories; 46g of fat). Well, gollllly, Sgt. Carter! That’s fantastic! By eating the Big Mac, I not only save all those calories but also cut my fat intake to 29g instead of 46g for one meal! I guess I’ll order the fries, too! But wait! What about the sodium content? The Big Mac has 1,040 mg of sodium; the Whopper has 1,450 mg. When you consider that the RDA is 2,400 mg, either one will get you nearly halfway to your RDA for sodium in no time flat. And remember, too, that the RDA amounts are based on a 2,000 calorie daily intake. So when you factor in the amount of calories, fat, sodium and saturated fat (with an RDA of 20g) of the burgers, neither is “healthier” than the other. Also consider that as editor-in-chief of a health magazine, the man’s lifestyle is likely to be less sedentary than the average person trying to drop a few pounds. In fact, it’s not uncommon for marathoners and runners to consume high-calorie meals as most will be expended during their run so that they have enough in reserve at the end of their run and don’t, um, die afterwards. If you’re truly serious about losing weight, here’s a thought: avoid fast foods. That isn’t my advice; that came from my doctors. And rumor has it that they know a little about the human body. Now I’m not saying I don’t enjoy an occasional fast food meal but I don’t make them a staple of my diet. (If I do eat out, it’s mostly chicken—I’ve given up red meat and fried foods.) I didn’t lose my weight by not brown-bagging it to work, not making healthy meals the night before, not cutting up watermelons and pineapples to make my daily 2 cups of fruit, or not drinking at least 2 pints of water per day. Losing and maintaining your weight is all about choices and if your dilemma is choosing between a Big Mac and a Whopper, you’re doing it wrong. Sure, David Zinczenko is good-looking, successful and had his book featured all over the place. But in Eat This, Not That! the only thing the dude is doing is saving you from reading the nutritional values and combining the information with pretty pictures in a perfect-bound package. Crap on a cone still isn’t ice cream no matter how you look at it, even if you once dated Rose McGowan. Look, if all you want is fast food nutritional information that is constantly updated, it’s available for free on Dottie’s Weight Loss Zone, my one source for Weight Watchers Points Values before eating out.